This past weekend I was up in British Columbia and I brought back some real Cadbury. Note the mini eggs; the package says that they are now available “year ’round”. I have showed amazing will power by not eating all of this in the past day. In fact, all I have done is sample a few things. The Canadian version of Junior Mints are more minty that the U.S. version, and the gummy candies were pretty bland. I’m looking forward to doing an Aero/Hershey’s Air Delight, and a Pep/Peppermint Patty comparison soon. I have so much enjoyed your blogs about Candy!!! 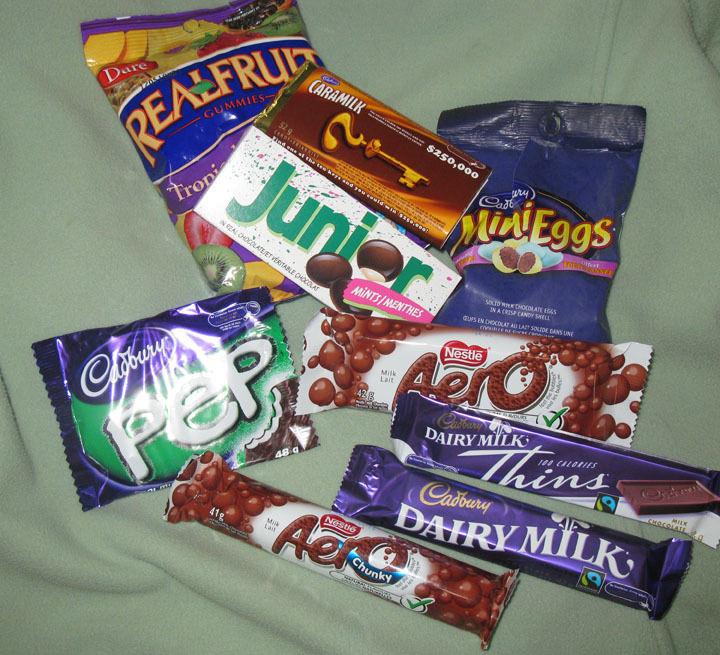 I reading through your achives now and its bringing back so many memories I have about some candy. I love how you buy and try all these different brands and from different countries. We have TJ Maxx here in Ohio too, I think I need to go check out the odd section of goodies they have, along with that we have Jungle Jim’s. Not sure if you’ve ever heard of it, but it has candy (among anything your can think of) from almost every country…I would go there and try different things, its been along time since I’ve gone there, but I think I know what I’m doing this weekend at some point. I hope you don’t mind if I get chance and find a few things, I’ll blog about them, with inspiration from you and your blogs!!! Thank you again and again I love your blog!!! Thanks so much, you’ve made my day. I would love to hear about your candy finds and memories. Sweets of all kinds hold such happy nostalgia for most people. I look forward to reading your posts.